Aidan's birthday party was on Sunday (more about that later). So that means I made some cupcakes. 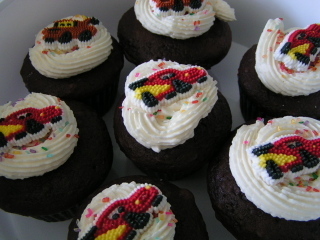 I used Lightning McQueen cupcake liners (not pictured), some Wilton Jumbo Sprinkles, and Lightning McQueen and Towmater candy toppers. Being short on time (more about that later), I used a box mix for the cupcakes. I made frosting following Sew Darn Cute's Smore's Cupcakes recipe. I've been pining for these for a while! First the good news - these cupcakes were awesome! The bad news is that I didn't add enough Marshmallow Cream and the frosting did not taste like marshmallows. I was so bummed - I didn't even figure out what I did wrong until today. I used 6 oz and the recipe called for 16 oz. However, this proves what a great frosting recipe it is - as it tasted just great and its consistency was just fine. Super easy, too! I did the trick of poking in my bag tip into the cupcake and then filling the outside. Always a nice treat - kind of like a Ho Ho! Since these did not turn out as planned, I didn't make the S'more Cupcakes (by dusting on the graham crackers and sticking in a Hershey Bar) but they were cute and tasty anyway! too bad about the frosting. Hey, now you have an excuse to make more cupcakes!